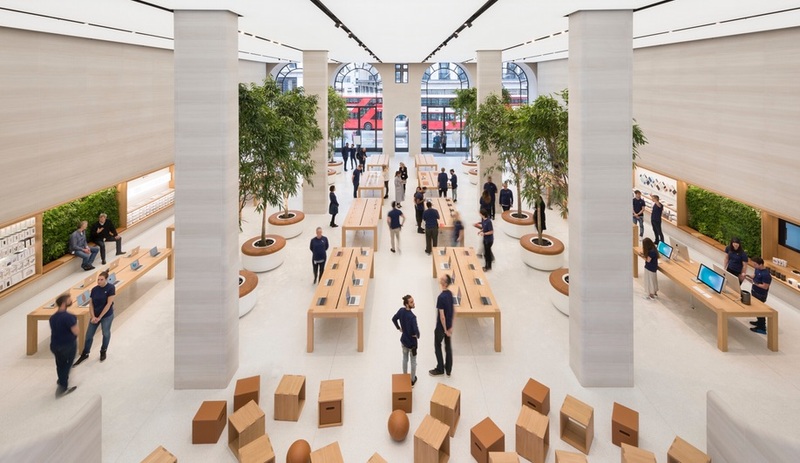 Two new Apple stores – designed by Foster + Partners and Bohlin Cywinski Jackson – have opened in London and New York, and while both channel the brand’s signature look, they also have some moves all their own. 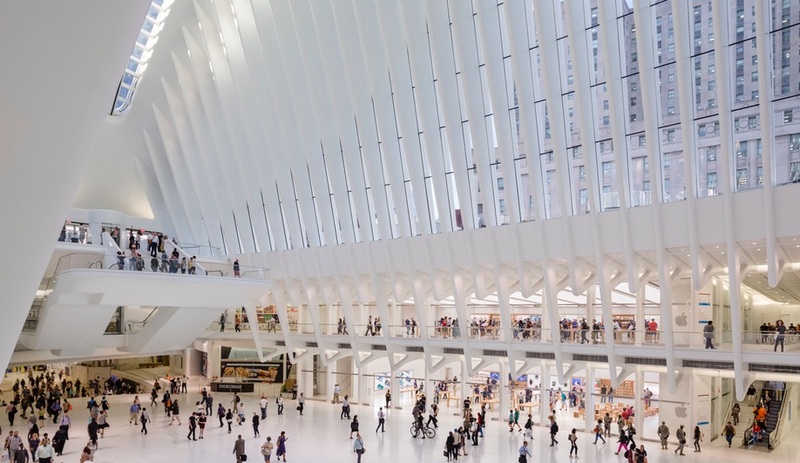 Santiago Calatrava’s WTC Transportation Hub was years in the making, and when it finally opened this past March, visitors were impressed – especially with the cathedral-like atrium. This space (seen below), situated just below grade and topped by a soaring oculus, now has its prime tenant: Manhattan’s newest Apple store, spread across two levels, now occupies a full quarter of the space. 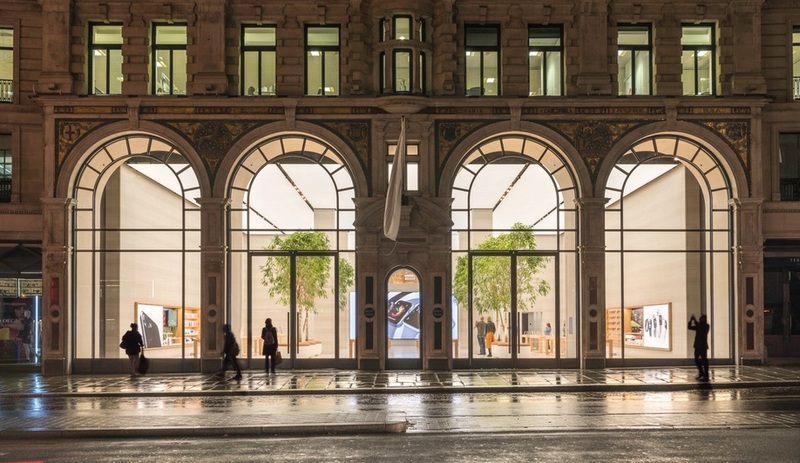 This is not Bohlin Cywinski Jackson’s first time fitting out an Apple store – their portfolio now includes seven across the city, including the iconic “glass cube” flagship on 5th Avenue. For the latest New York store, BCJ has settled the brand into its distinctive home behind the mammoth white-painted steel ribs of Calatrava’s structure, and connected the 1,100-square-metre interior to the oculus’ circulation with 16 sets of display-glass double doors. 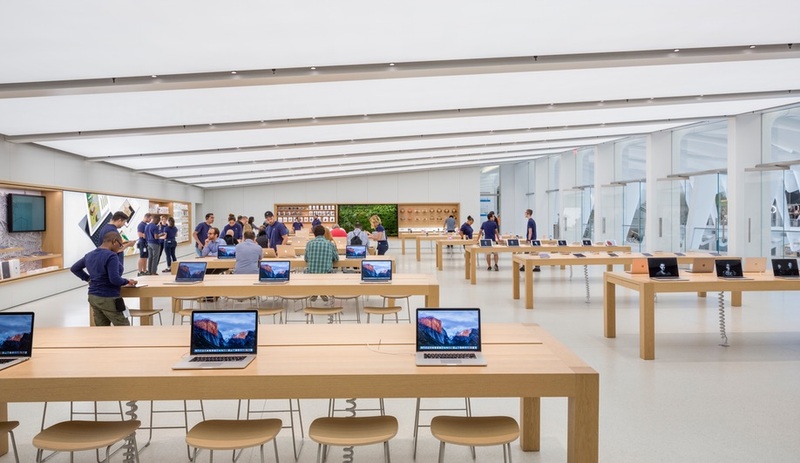 Many of Apple stores’ signature moves are here – the long oak tables, paired with matching display shelving; the off-white flooring and matching acoustic wall coverings – but there are also a few gestures that signal a fresh direction for Apple’s future stores. 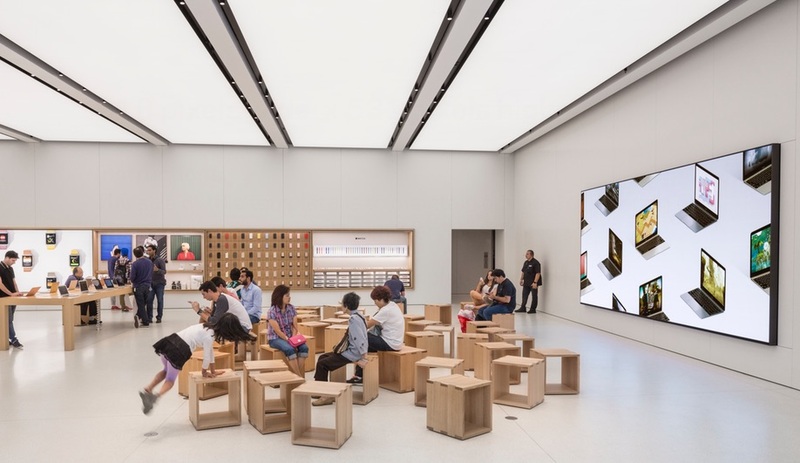 At one end of the lower-level space, a colossal 6K television for product demos or in-store entertainment fills most of the wall, while a cluster of moveable wooden cube seats offers a gathered audience somewhere to perch. Perhaps the most prominent gesture are the ceilings, both a wall-to-wall expanse of backlit white panels that flood the space in a soft glow. On the upper level, the ceiling slopes gently upward towards the glass bays, directing the gaze out to the wide-open atrium. 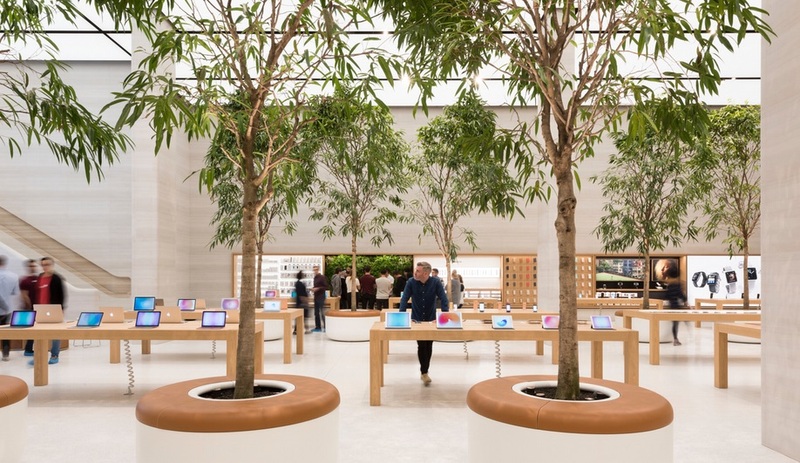 Across the pond, Apple’s outlet on Regent Street – a high-end shopping district in London’s West End – is not a new location, but a renovation; in fact, in 2004, it was the first Apple store opened in the EU. But like the World Trade Center project, the Regent Street location expresses the brand’s DNA even within a very distinctive structure – in this case, a listed 1898 facade with high arched windows, the former studio of the Venetian mosaicist who completed the ceiling of St. Paul’s Cathedral. 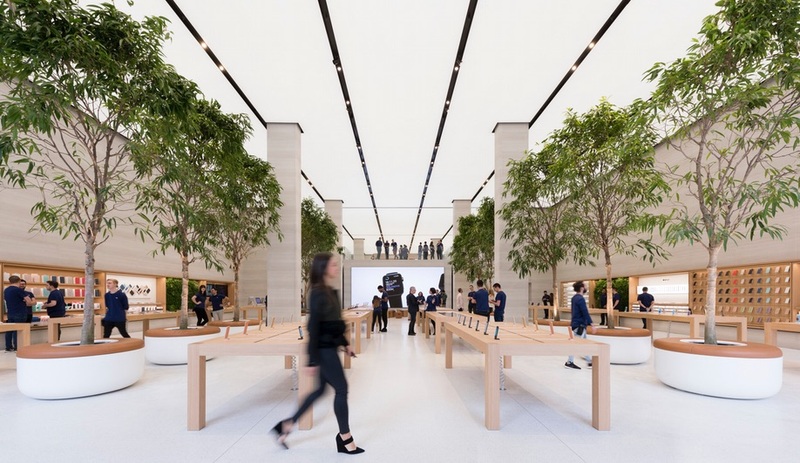 With the renovation, the team from Foster + Partners collaborated with Apple’s senior VP of retail, Angela Ahrendts, to make the space feel more casual and dynamic than a typical shopping environment. Capitalizing on the location’s impressive windows and towering pillars, the team developed a “town hall” concept which plays up the double-height space – also topped with backlit panels that reach from wall to wall. 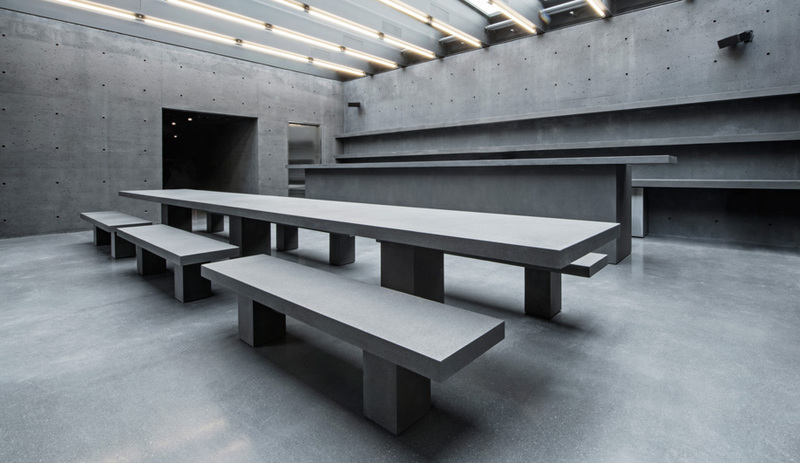 Taking full advantage of the 7.2-metre ceiling height, the team added potted trees; the planters’ lids are upholstered with stitched leather, doubling as seating. 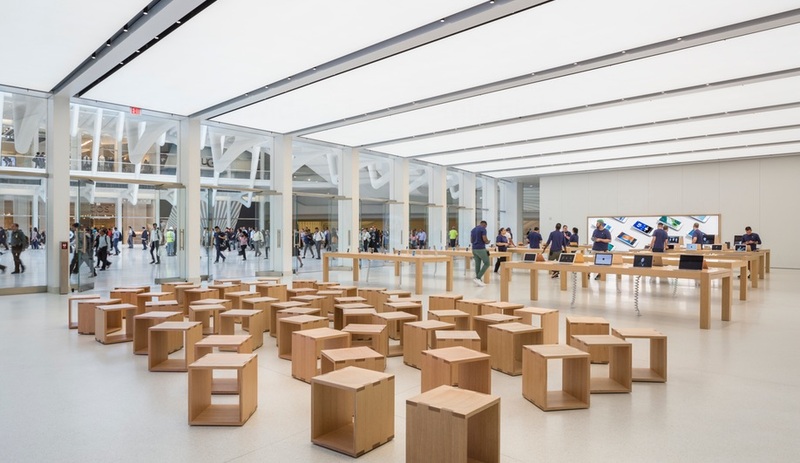 And, in another move echoed in the World Trade Center location, one end of the space includes a 6K video screen and an assembly of wooden cube stools. 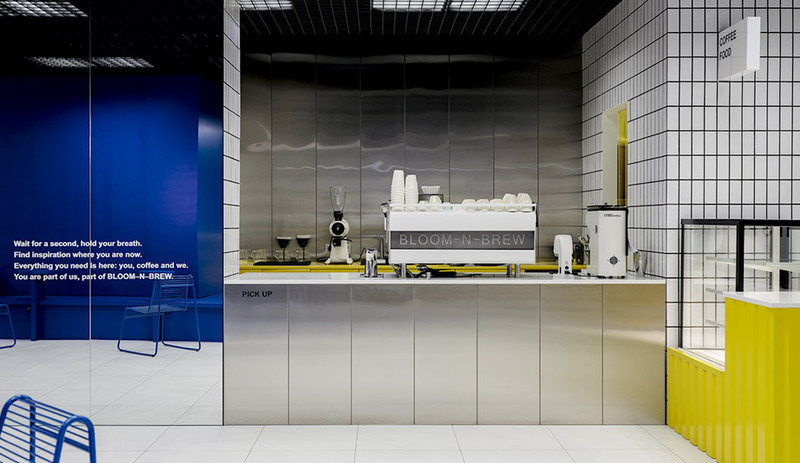 Above the video screen is a mezzanine that overlooks the entire space, accessed by staircases on both sides in what may be the store’s most impressive peculiarity. 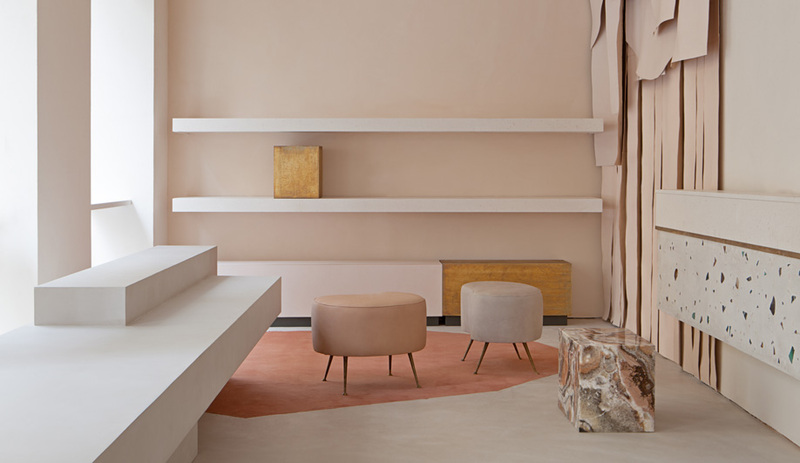 The columns and the walls that run the length of the store above recessed oak display shelving are clad in pale sandblasted stone, and where the staircases rise to the mezzanine there are sensuous railings carved from matching stone. 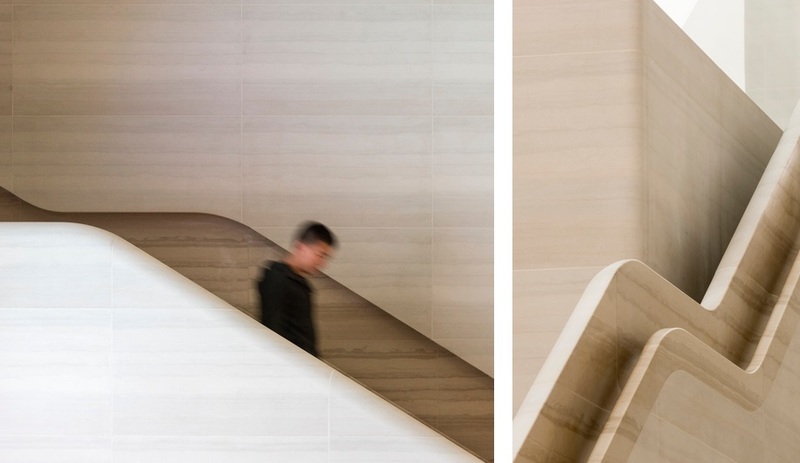 These handrails, recessed into the wall on one side and freestanding with an inset grip on the other, are hewn from a darker stone that contrasts subtly with the sandblasted walls. In form, these rails are not much more than a curving line carved in stone, but the result combines the permanence of a natural material and the understated luxury of custom masonry.